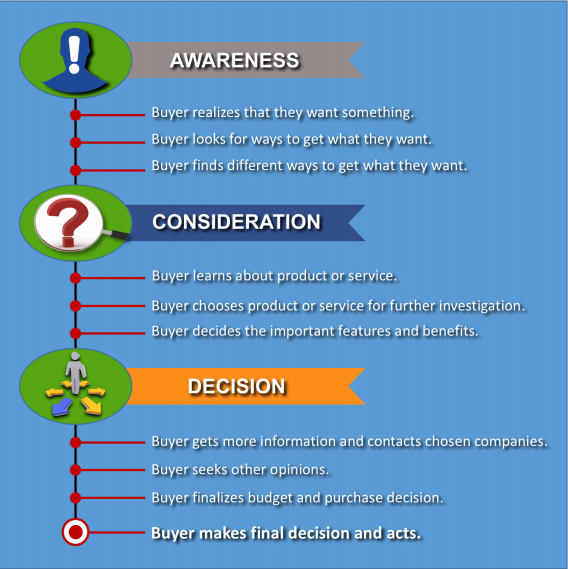 Mapping customer buying cycles is simply an illustration or outline of the steps that your best customers go through to find, evaluate, and transact business with your company. Once completed, the map shows you how to influence, engage, and convert active buyers of your product or service into customers. The longer your customers buying cycle, the more the sources that they will use to gather information will include digital resources like Google, websites, online reviews, information, video, maps, directories, mobile applications, pictures, and more. Throughout the entire cycle you can measure your effectiveness at attracting, engaging, and converting active buyers into customers. Using your actual performance information, you can optimize any part of your marketing, and start generating better returns. Step 1: Take the time to identify your best customer types. Step 2: You map your best customers’ buying cycle by writing down what happens during each stage of their buying journey. Use the “Buying Cycle Stages” image below to help you understand what happens during each stage of your customer’s buying cycle. Who your best customers are? What steps they took before they found you? What they did after they found you, but before they decided to buy from you? How much time did they take from the time that they decided they wanted you product or service until the time that they transacted business. Step 3: Now that you have a good understanding of your top customers, list each stage of the buying cycle; awareness, consideration, and purchase for the top customer type that you identified in Step 1. Step 4: List as many actions, motivations, questions, and barriers that are likely to occur during each stage of the customer’s buying cycle. This should include outlining the sources that the typical customer uses to find and access the information, benefits, and services that they want? Actions include what customers do during each stage. What actions are they taking to move themselves to the next stage? Motivations include why the customer is motivated to go to the next stage? Why do they care? Questions uncover the uncertainties and issues that might be preventing the customer from moving to the next stage? Barriers include anything that adds additional processes, costs, structural hurdles, or obstacles that might keep customers from moving to the next stage? Goals identify your customers’ goals at each stage of the buying cycle. Step 5: Create a touchpoint map that illustrates steps 3 and 4. Step 6 (Optional): Add notations to your touch-point map where there are opportunities to influence customers during their buying cycle. Repeat the process for your next top buyer type. Your customer buying cycle map needs to represent your customer’s interactions as they experience them. Use interviews and surveys as needed to support the mapping process. Create maps for each top customer type. Include customer emotions whenever possible; such as the emotions of driving a new car, or taking a vacation. 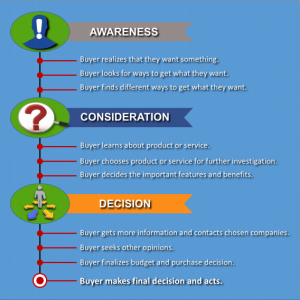 Identify critical moments throughout the buying journey on your map. Include time frames for each step of the buying cycle. Warren Kolber is a Managing Partner of URWA Consulting. Warren has more than 30 years of successful marketing and business development strategy and implementation experience. Warren enjoys and excels at helping non-profit, corporate, and start-up organizations develop, measure, and implement new marketing strategies aligned with organizational goals. Copyright. URWA Consulting. 2016. (303) 223-4988.